 A thorough and well-documented analysis by Paterson (History/U of Connecticut) of how Castro came to power in Cuba and why the United States failed to stop him. Drawing on U.S., Canadian, and British records, as well as considerable research in private American archives, Paterson launches an unqualified assault on the notion that Fidel Castro was a Communist prior to his accession to power: ``That Castro later- -after victory and repeated crises with the United States--declared himself a Communist cannot erase the pre-1959 record of minimal contact'' between the Cuban Communist Party and Castro's movement. Indeed he argues that Castro's movement ``actually distrusted the Communists because of their one-time sordid alliance with Fulgencio Batista.'' 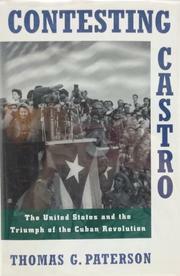 Nor, he notes, was the State Department neglectful of the possibility that Castro might be hiding Communist sympathies. On the contrary, they repeatedly looked into the matter, and the failure of the United States to act more decisively against Castro was in part a reflection of the failure to find any connection between him and the Communist Party or the Soviet Union. A variety of American officials found in him, rather, ``gargantuan ambitions, authoritarian tendencies, and not much in the way of an ideology of his own.'' Paterson believes that the United States showed ``a deadly combination'' of ``ignorance and arrogance'' in dealing with the situation and that its failure to show an evenhanded approach to the civil war in Cuba further stimulated Castro's already lively anti-Americanism. Paterson says that there have been three views of Castro: that he was a ``power hungry manipulator,'' a ``supremely pragmatic politician,'' or, most charitably, that he was a leader in training, feeling his way to a world view. Favoring no one theory, Paterson does show how skillfully Castro maneuvered to achieve his objectives. Paterson does not approach this matter without his own biases (against ``right-wing ideologues'' and officials ``fixated on the Communist issue''), nor did he have access to the Cuban or the Soviet archives; but this is a careful, well-constructed, well- argued, and essential source.